Once we receive your application we will confirm your booking dates and times as soon as possible and confirm all necessary details. We will be happy to welcome you at the Mikulov Chateau, where we’ll show you around the premises and recommend those most suitable for your event. You can also contact us via e-mail or talk to us over the phone. We look forward to welcoming you here and are happy to help you with all the details that will make your event perfect. Mikulov Chateau is the dominant feature of this picturesque South Moravian town, visible from almost everywhere in the town. So don’t be afraid of losing your way. Nonetheless, here are some useful tips on how to get here. Entrance to the chateau by car is possible only with special permits, and only a maximum of three parking spaces are reserved for each event. Hence we will navigate you as close to the chateau as possible, after which we would be very happy if you came to us on foot. Before entering Mikulov, turn left onto road 421, Brněnská street. Continue straight on for about 900 m before bearing right onto 22. dubna street, which then continues as Komenského street. Turn left at the crossroads onto Koněvova street. At the end of the street, bear left onto Česká street. You can park in this area. From here you can walk to the main square and then up to the chateau Gate (see the image for directions). At the first roundabout in Mikulov turn right onto Republikánské obrany street. Continue onto Piaristů street, then turn right onto Komenského street and turn left at the next crossroads into Koněvova street. At the end of the street, bear left onto Česká street. You can park in this area. From here you can walk to the main square and then up to the chateau gate (see the image for directions). Before you approach Mikulov, make sure you’re on the E 461 road; thereafter you can follow the instructions listed in the section “Travelling by car (from Vienna)”. If you are staying in Mikulov and have booked accommodation, we highly recommend you leave your car at the hotel/guesthouse and walk to the chateau. 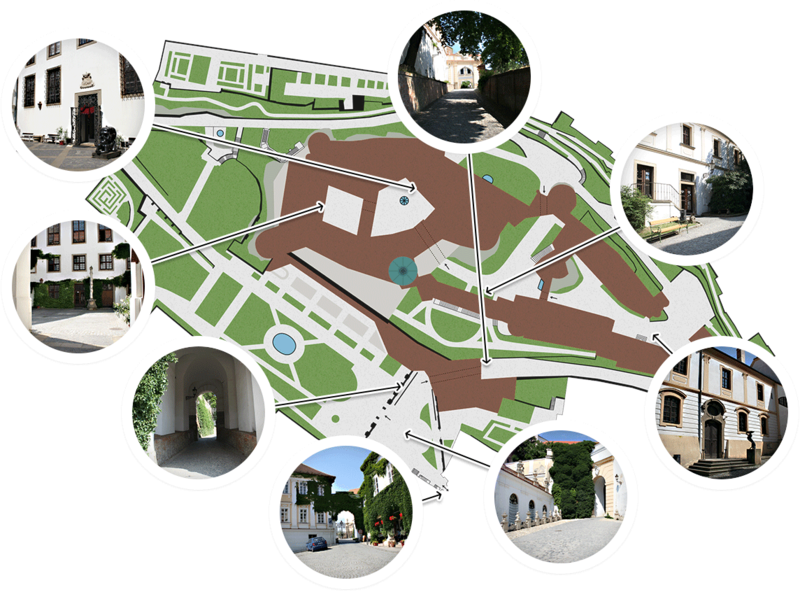 If you are in Mikulov only for a day, you can use the parking zones in the centre of the town. 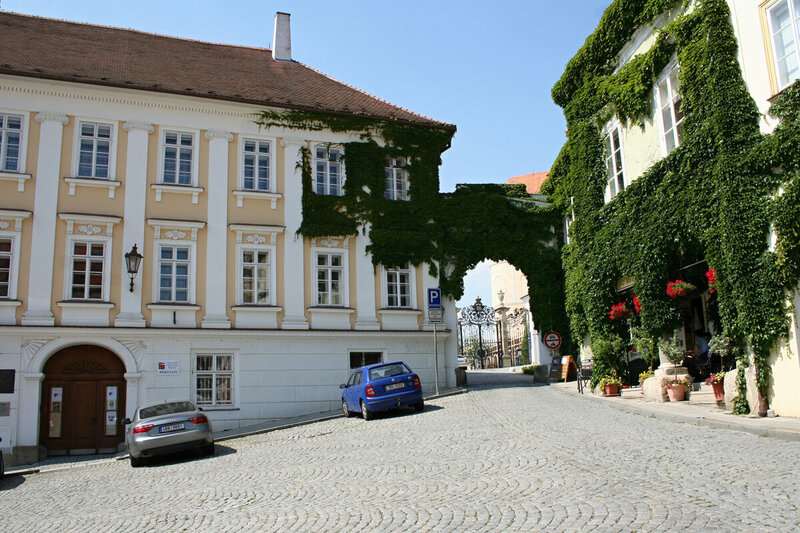 You can enter the grounds of Mikulov Chateau through the main entrance, which is a gate adjoining the main square. You can also use the side entrance on Husova street, but keep in mind that this is closed at night. We have prepared a detailed photographic guide that will help you get to the chateau. The Regional Museum in Mikulov is a semi-budgetary organization of the South Moravian Region. besides hiring out the halls of Mikulov Chateau it also organizes regular exhibitions and looks after the permanent displays of the museum’s collections.